Here we are, many of us in the middle of Spring Break, heading into one, or just getting ready to enjoy a long weekend with our families. Many of us are eagerly awaiting to get our kids back in school and back to the routine. I for one, have a child who needs the steady structure of school, and actually, for the most part, is happy to be there. For others however, school can be a source of dread and anxiety. You might struggle every day just to get your child out of bed. You beg and plead, hoping for a day when they happily get on the bus. You might be dealing with a newly diagnosed learning challenge and an I.E.P. (individualized education plan). Your mind is a tangle of questions, worries, and wondering what this all means. You might spend so much time with the principal, guidance counselor and other specialist that you feel you know them better than your own family. You might secretly envy other parents whose children are never cited for disciplinary problems, for being a distraction or for being unfit for the classroom. You might wonder if your child will make it to the next grade. Maybe at this point, you already know they won’t, and the idea of watching other children leaves you feeling distraught and alone. You might have a child who comes home in tears every day. No matter how reassuring you try to be, no matter how many promises of a better tomorrow, you feel defeated. You might have a child who makes you wonder how you can possibly make it through the rest of the school year. I don’t know you or your story. Every family is different, and I can’t possibly give one answer that will make you feel better. I will tell you I have been there. In the first few months of kindergarten, I was in your shoes, wondering if my child was cut out for school. I questioned my parenting skills and worried I had failed my child. I doubted myself over and over. I needed to cut myself some slack. We need to cut ourselves some slack. If your child is having a hard time, please don’t get caught in the vicious cycle of blame. When our kids don’t turn out as we expected (and do they ever?) We often wonder what we could have done differently, what signs we missed and how others surely are better suited for this whole parenting gig. You are a good parent, even if your child struggles more than others. You are a good parent,, even if school is a source of anxiety for you and your child. You are a good parent, even if sometimes your child has trouble behaving “appropriately” at school. You are a good parent, if your child needs to learn things a bit differently. You are a good parent. Use this break as a gift. You deserve to celebrate how far you have come. You got through those first months of school, and you will get through the rest. 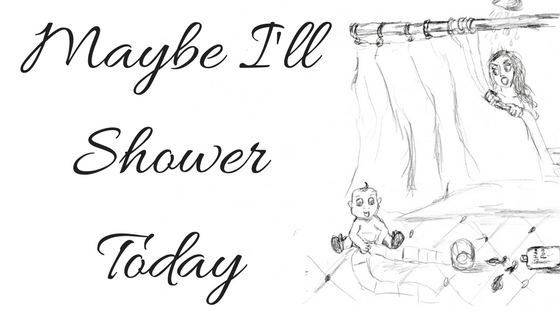 A version of this post originally appeared on Maybe I’ll Shower Today’s Facebook page. This entry was posted in Inspire, Smile, Think and tagged children, education, family, parenting, school on April 16, 2019 by Maybe I'll Shower Today.